Rain Taxi champions aesthetically adventurous literature. Community Driven: Rain Taxi serves as a catalyst in the literary community, creating meaningful dialogue among readers, writers, and publishers. Thoughtfully Curated: In a world increasingly saturated with unfiltered content, Rain Taxi discovers and (promotes) high-quality literature. Rigorously Reviewed: Rain Taxi elevates the review as an art form and publishes criticism that is intellectually challenging and illuminating. Artistically Inclusive: Rain Taxi explores challenging work from diverse voices in multiple genres and formats. Print Focused: While embracing online audience engagement, Rain Taxi celebrates and promotes the power of print. Looking for a great read? Rain Taxi can help! Rain Taxi is a literary organization that champions literary culture through programs and publications that foster engagement with innovative writing. 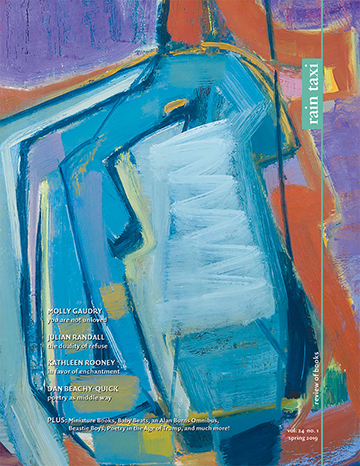 Our main vehicle is the award-winning print quarterly Rain Taxi Review of Books, which connects readers to books of merit that might otherwise get overlooked, and the Online Editions on this very site, which have material separate from the print editions. With coverage of fiction, poetry, nonfiction, art, graphic novels, translations, and more, Rain Taxi exists for readers and writers, literary publishers of all shapes and sizes, booksellers, educators, and kindred spirits who want books to keep flourishing in a distracted society. Rain Taxi also organizes the Rain Taxi Reading Series and the annual Twin Cities Book Festival, both of which bring literature to life and provide a public celebration of the literary arts, and the Twin Cities Literary Calendar, which lists all events happening in our home region. In all our programs, we are committed to artistic diversity, cultural relevance, and widespread access. RAIN TAXI, a winner of the Alternative Press Award for Best Arts & Literature Coverage, is a quarterly publication that publishes reviews of literary fiction, poetry, and nonfiction with an emphasis on works that push the boundaries of language, narrative, and genre. Essays, interviews, and in-depth reviews reflect Rain Taxi's commitment to innovative publishing. Our print journal is distributed in over 250 locations nationwide-mostly independent bookstores-and is also available by subscription. An accompanying Online Edition, with completely different material, is posted to our website each quarter as well. Together, the two publications offer readers a broad look at the noteworthy writing and art being published today. Rain Taxi also publishes a chapbook series, and hosts a wide range of literary events in the Twin Cities. In 2013, Rain Taxi was awarded Best Literary Events by City Pages. Rain Taxi has been nominated five times for the Utne Independent Press Award for Arts & Literature Coverage. Rain Taxi won the distinctive award from Utne in 2000. Thanks Utne! For a bit about our history, read this City Pages newspaper article or this one. For poet Ron Silliman's blog entry about Rain Taxi, click here. We thank Mr. Silliman for his kind words. Editor Eric Lorberer was also interviewed in December 2005 for the blog MobyLives. The MP3 of the interview may be found here. And to get a real sense of the Rain Taxi's history, be sure to browse the archives of our Online and Print Editions.